Riverside County is preparing to study a proposed development eight miles east of Coachella that imagines thousands of homes on land near the southern edge of Joshua Tree National Park. The project, which developers call Paradise Valley, proposes 8,500 new homes and about 1.38 million square feet of commercial space on 1,800 acres of land. Developers said the project would be built in five phases, but declined to describe a time frame since getting approval from county and state agencies often takes years for projects this large. "Obviously something of this size has to be treated delicately," said Frans Bigelow, a senior advisor with development company GLC Enterprises. "But the end product will clearly benefit (from the process). Ultimately, the project will be in such a phenomenal location." Paradise Valley, if approved, would be built in a region called Shavers Valley. Development would stretch both north and south of Interstate 10 between the Cactus City rest area and Box Canyon Road. In a planning document filed with the county, GLC Enterprises explained that they owned 5,000 acres, but planned to build on only 1,800 of them. Construction would include homes, offices, shopping, industrial and public facilities, along with infrastructure improvements. The developers also promise to create 110 acres of parks and trails and permanently preserve 3,000 acres as natural open space. "The project is proposing a specific plan that would essentially be a new town," Riverside County planner Matt Straite said at a public meeting Wednesday. This is Paradise Valley's second attempt to create that town. GLC Enterprises first proposed the project in 2004, and that version was much larger — it would have developed all 5,000 acres of land and built nearly 9,000 homes, a golf resort, a shopping center and a retreat center with Salton Sea views. That project never completed an Environmental Impact Report, however, and development stalled. By the time GLC Enterprises started over in 2009, the Coachella Valley Multiple Species Habitat Conservation Plan had been implemented. Designers reduced the size of the project and eliminated the golf course. The Pinkham Wash still runs through the project area, though. And development would stretch north into the foothills of the Cottonwood Mountains, which form the southern edge of Joshua Tree National Park. At Wednesday's meeting, National Parks Conservation Association program manager Seth Shteir asked the county to study whether the project would create light pollution, disturb unique Native American sites or disrupt wildlife corridors or natural habitats. "Joshua Tree is an incredibly ecologically sensitive park. It's the coming together of three distinct ecosystems," Shteir said. "It also has significant cultural and historic and archaeological resources and Native American spiritual sites." 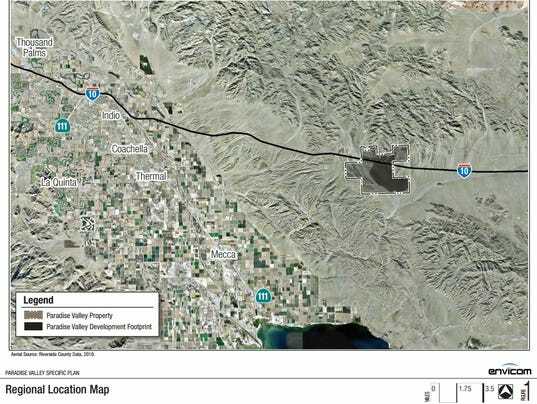 Buildings at the site would get power from the Imperial Irrigation District, gas from the Southern California Gas Company and water from the Coachella Valley Water District, according to a detailed project description filed by GLC Enterprises. 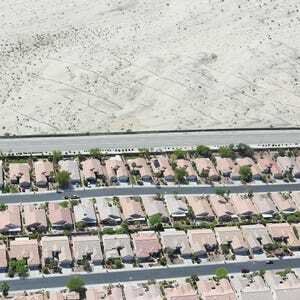 CVWD requires developments of more than 500 homes to complete a "water supply assessment," in which developers need to show that there are sufficient water supplies for the next 20 years. Paradise Valley is the latest ambitious proposal for an eastern Coachella Valley development. Last summer, the city of Coachella approved La Entrada, a 2,200-acre project that would bring 7,800 homes to the city near Avenue 50 and I-10. In 2012, the county approved plans for Travertine Point, a 16,655-home development on the northwestern shore of the Salton Sea. The Center for Biological Diversity and the Sierra Club filed a lawsuit later that year, seeking to stop the project. Developer Paul Quill told The Desert Sun at the time that construction was still many years away. Until Nov. 10, Riverside County planners will accept public comments about what the county should study while it prepares an Environmental Impact Report for the Paradise Valley project. Then, development company GLC Enterprises and county officials will develop a draft version of the project's EIR. Residents will be able to read that report, file comments on it, review any updated versions and comment on those. Finally, the county will host public hearings on the project. Paradise Valley will only be able to proceed once a final Environmental Impact Report is approved, which planner Straite said could take "years." Comments about what should be studied in the EIR can be submitted to Matt Straite at mstraite@rctlma.org. A preliminary report identifying issues that will be studied in an Environmental Impact Report is available at planning.rctlma.org. Palm Springs, California (July 8, 2013) – Hard Rock Hotel Palm Springs is now taking reservations in preparation for the property’s eagerly-awaited Fall opening. Music aficionados and luxury resort fans alike will now be able to reserve rooms at HRHPalmSprings.com or by calling 1-855-4U2-ROCK (1-855-482-7625) for arrival in early October, with promotional rates starting at just $159 per night. Hard Rock Hotel Palm Springs will offer a VIP rock star suite, Rock Spa®, Body Rock® workout facility, Rock Shop® featuring Hard Rock’s iconic merchandise, chic dining venue, local hotspot lobby bar, and sizzling pool scene where guests can enjoy cocktails, chaise lounges and blazing fire pits. In addition to 163 premium guest rooms, the hotel will offer 20,500 square feet of ballroom and banquet facility space and an @Biz Business Center. True to its musical roots, music and pop culture lovers will be treated to music memorabilia lining the hotel walls from local and global icons, including indie artists, rock n’ roll legends and hip-hop stars. Hard Rock Hotel Palm Springs will also ignite the region with outstanding live entertainment, adding to the area’s rich music traditions like the Coachella and Stagecoach Music Festivals.